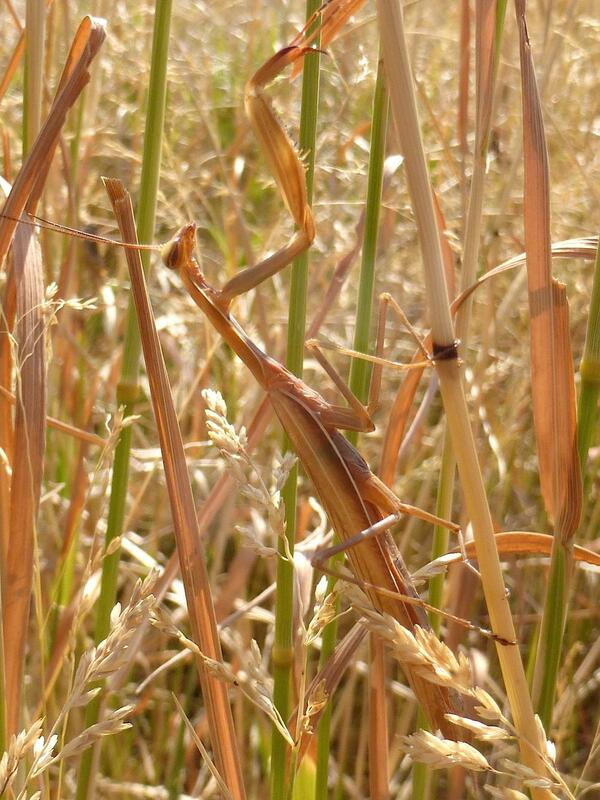 You may know mantids as masters of camouflage. They are patient and incredibly effective “sit and wait” predators, using their great eyesight and raptorial forelegs to quickly capture their prey. But did you know that they have an ear? Yes, an ear. Just one. Located in the middle of their chest or thorax. In fact, they're the only animals known to have just one ear. Located in between their middle pair of legs, their ear is in two halves, but both halves function as a single unit. However, they don’t hear the same things that you and I do. Their ear is specially developed to hear high-pitched tones at a range from 30,000 to 150,000 hz, just beyond our own hearing capacity of 20,000 hz. The mantid’s range of hearing happens to coincide with the frequency of echolocation calls of most bats. Thanks to this ear, when a bat has a mantis in its sights for a meal, the mantis will suddenly make a turn and dive-bomb toward the ground. This evasive maneuver does not always work, but often saves mantis’ life. If you happen to have a pet mantis and want to speak to it, you can save your breath. They can’t hear you. The frequency of our voices is far too low for them to hear. They might seem like good listeners, but they just can’t hear you.